I had purchased this issue in KL Malaysia early this year. 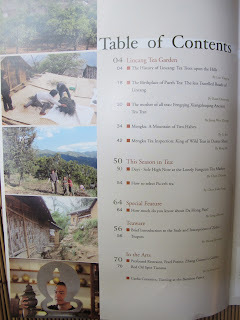 This is "The Art of Tea", issue 12. 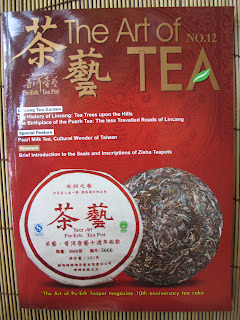 Printed by Wu Shing Publications, Taiwan, this magazine is in English and is mainly a collection of articles about tea in general. This issue, no 12, had a few articles on pu erh, an article on tea ware - zisha teapots, tetsubin and Tianmu (rabbit hair) bowls. There were also news on the various tea expos as well. This magazine has lots of nice photos and it does make interesting reading. The only setback, to me, was its price. It was going for 45rm (about US$16) which I could in KL, purchased a very nice pu erh cake/brick with the money. 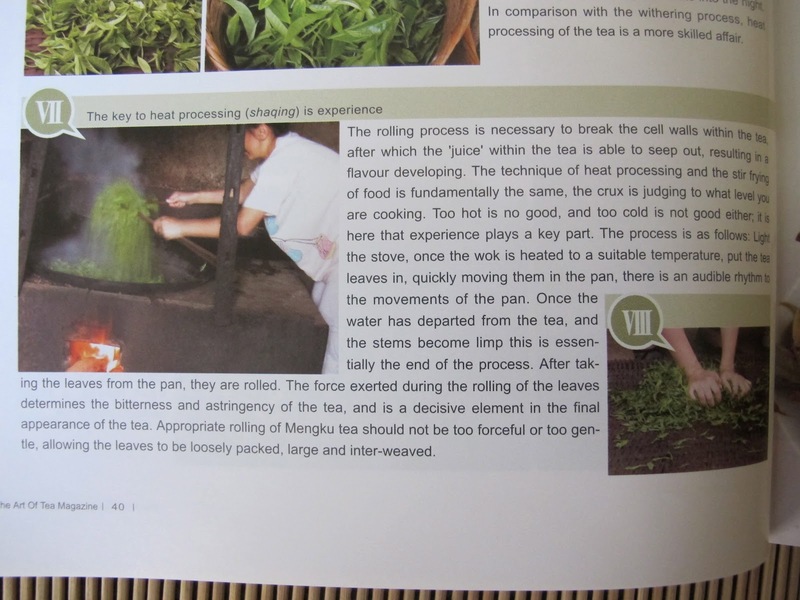 Pix 3 shows the shaqing, or 'kill green', a step in pu erh tea processing where the tea leaves are 'fried' to soften the leaves and break the cell walls of the leaves so as to maximize flavor when the tea leaves are brewed. Notice the wood fire, which I think contributed the smoky scent in the tea leaves in this instance. Mr Chan Kam Pong, aka Cloud, a well known writer on Chinese Tea, had also written an article; 'How to select Puerh Tea'. "The revival of Puerh culture and corresponding developments have brought forth a multitude of different styles. They can roughly be classified as: large factory, small factory, home workshop, large tree, plantation tea, pure material, blends, famous mountains tea, dry storage, wet storage, natural home aging, raw, ripe, pressed cake, 'tuo' style, brick style, loose leaf, gift box, cardboard tube, bamboo tube, wooden box collectibles and event memorabilia. After factoring in aged puerh from different years, the number of types of Puerh teas grows from nearly one thousand to well over ten thousand. Superficially, this situation appears to provide an excess of choices." "Some people prefer spicy and stimulating flavors, while others are drawn to sweet flavors. Still others do not enjoy either of these flavors but instead prefer mild and gentle tastes. Puerh provides many different types of flavors, and different people may be drawn to different teas. Those who enjoy dry stored teas may not prefer teas stored in humid conditions, and vice versa.......Consequently, it is important to know your flavor preferences when buying tea." "....when looking for Puerh tea to buy, you need to look for something that will not only satisfy you as a daily drinker for the next several years. You should also try to predict just what you will enjoy in ten or even twenty years. I suggest people looking to start collecting Puerh consider broadening their range a bit. That is, purchase a number of types of tea as a precaution against changing tastes. Also, consider gong a bit deeper. If you find that you really like a certain tea, you will wish you had bought more of it." My thoughts on the article - I understand cloud's good intentions of suggesting purchasing or choosing a tea by predicting 'what you will be enjoy in 10-20 years time'. This will save me lots of money as a 20 year old tea I like, will most probably be very costly and very hard to find. But.....what I like in 10 or 20 years time is quite unimaginable for me. I believe 2 factors that will influence this 'prediction' - state of my finances now and in the future and more importantly, life experiences, that I will go thorough, will affect my taste preferences for tea in the future. Sounds mambo jumbo, but to summarize - its difficult to tell what I like, in 10-20 years time. Nothing is static. 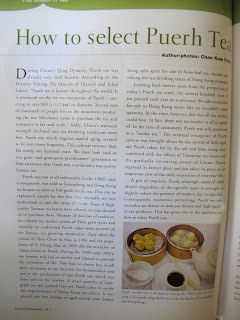 Even puerh tea - I had noticed in my recent travels to Guangzhou and Malaysia; that many new raw pu erh tea seem to taste different, like the tea had been processed in a new way, extremely drinkable, very light, floral and fresh tasting. I do wonder whether such teas will make good candidates for aging but thats another story. 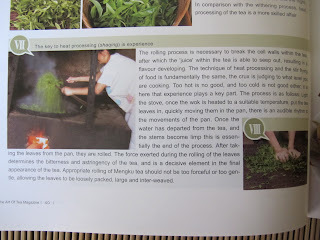 I am no expert in pu erh tea. I am not able to predict what a pu erh tea cake I have in my hand will taste 10-20 years down the road. Many tea collectors worldwide have different tea storage conditions that may give result in their pu erh tea having its own aged character. "As I explained previously, only after ten years do you learn that the tea you have aged is not the right one and is incapable of developing an ideal flavor. Eventually, you end up buying ready-for-consumption aged puerh from Guangdong tea sellers and discover that buying aged tea to drink actually makes more sense than storing the tea yourself. It also takes up far less space." Time for a cup of tea. And do watch the queen playing a role with 007 in the opening of the London Olympics. Salute! 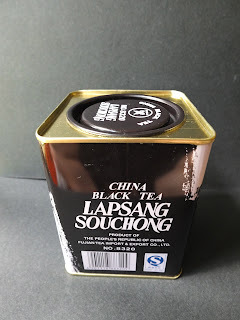 "Lapsang Souchong processed in traditional way is produced in Wuyi-mountain ranges in China where the foggy high mountains with thick forests provide the best natural environment for tea growing and is characterized by stout leaves with the perfume of pine wood mellow-taste an fragrant aroma being on of the China's famous teas." This tea known in chinese as "zheng san xiao chong". I am making an intelligent guess, but the terminology 'lapsang souchong' is a lost-in-translation phrase that caught on with time. This is a black tea that had been smoked with burnt pinewood. This is a smoky tea......really......one of the smokiest tea I have come across. When I had my first sip, I had imagined smoke coming out of my ears. But this is a very drinkable tea. It is quite addictive as well, if you enjoy real smoky tea. The smoke scent is like a morning after campfire where you can smell the smoke from the dying embers. Together with the taste of black tea, the smoke seems to complement well with the tea making it a delicious drink. 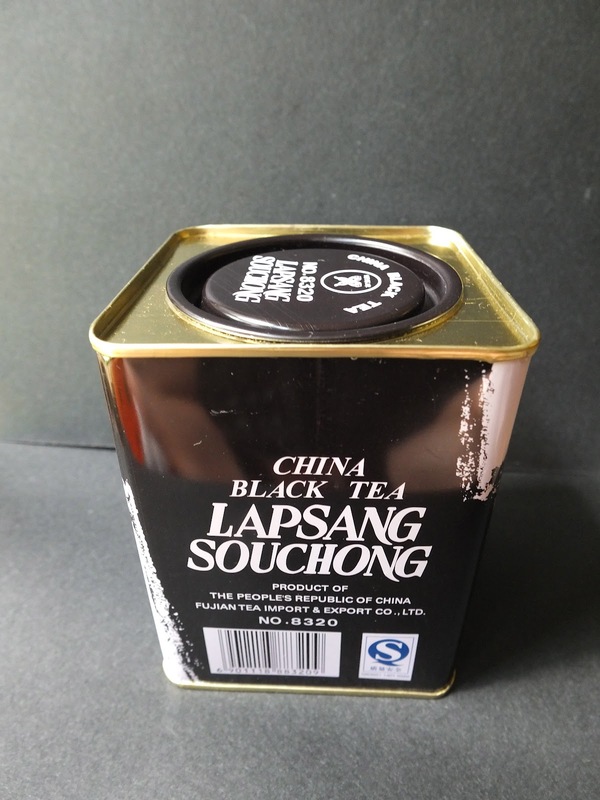 This tin of lapsang souchong, is produced by Fujian Tea Import and Export Co (butterfly logo), and comes filled with 200g of this tea. I brewed this tea by taking a very large pinch and putting it in a mug, filling it with hot water. Do not use a clay teapot for this tea and the smoky aroma may linger for a considerable time in the teapot after use. There are now 'lapsang' that is available without the pinewood smoke, but I recommend the original version. I had purchased this tin for less than $10. Value for money. "Just as in your tea consumption, you need a varied diet when reading tea blogs. "If you need the cold hard truth and real thinking- you head straight over to MarshalN because he is tirelessly challenging us to drink better teas, think for ourselves and not lapse into complacency. But sometimes you don't want to think critically about all the mediocre tea you've bought. You just want to feel good about puerh in general. That's when you head over to read sunny blogs likeWilson's Traveling Teapot. Wilson exudes the most overwhelming aura of positivity. You can tell straightaway from the title font of his blog that he will provide you a cheerful experience and it's rare he meets a beeng he does not like. He's mostly a shu drinker and he always manages to focus on the positive. (I had not been too keen on my Haiwan and Menghai shus but he fixed that for me and I'm excited to retry them. Thank you Wilson!) "
1. Thank you for the nice write up. I am honored that I am being compared to MarshalN, regarded highly by the internet tea community. Although I am on the opposite end of the scale - his is the cold hard truth while mine is the sunny blog, it felt real good when I could 'exude the most overwhelming aura of positivity'. I felt like Yoda for a second. I met MarshalN in Hong Kong last month. He is very passionate about Chinese Tea. But..... he is a fun person. Really! 2. Yes, I try not to delve on the negatives as I personally feel what is positive or negative about a tea is a personal preference. There were instances where I am with tea friends sampling a tea and I was quietly asking myself why I did not like a particular tea sample when the rest seem to like it. I believed that I have not reached that level of appreciation.....yet. That's another story. 3. I am happy when I brew my pot of tea, drinking them and blogging about them. I hope to infect my readers with my enthusiasm for tea. One interesting purchase at the tea expo was this 2011 Xiaguan tuo. This is the "Long Ma" tuo, which meant (I think) - year of the dragon - Malaysia. You can see the base of the box (pix 3) has the outline of Kuala Lumpur iconic Petronas Tower. I think this would make a nice addition to my tea collection. Tea exhibitors that took up a booth at this expo were also invited to submit their teas for a blind test competition. This meant that a tea dealer or teashop can submit a tea to the tea expo tea fraternity for judging. The tea are packed in standardized small packets and a numbered sticker is assigned to that tea. Tea members can participate, test taste and give their judgements on their preferred tea, not knowing the tea belonged to which company, teashop or dealer. Pix 4 & 5 shows a pu erh that had won gold medal status for 2 years. This 'Yi Wan Shui' label had won gold, for 2 years. I have tasted the tea at the expo, with my Malaysian tea buddy Auhckw, and both of us found the tea to be satisfactory. I will return next year for the next tea expo and will look at this tea again. I enjoyed coming to this KL tea expo as its location to be in a mall appeals to me. It is convenient in terms of accessibility, great choice of meals and I could do other things at the mall. I appreciate the lively atmosphere of the expo participants. It was very friendly and with little buying pressure, I could, with my Malaysian tea buddies, sample the teas that were on offer and have a great time as well. 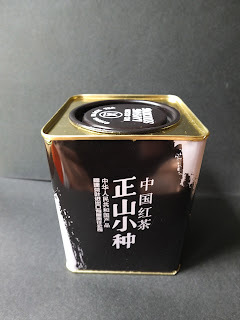 You can see, from the last pix, that I had also purchased a Dayi 2011 raw square brick called the '92 fang-zhuan' based on the popular 1992 fangcha raw pu erh. I would like to apologize to my readers for my one month absence from my tea blogging. I was away in Malaysia, Hong Kong and China. I will tell you more about my tea adventures in due course. I managed to attend Malaysia Tea Art & Cultural Expo 2012, held in Kuala Lumpur from 16-24 Jun 2012. I had attended last year's expo at the same venue and had found it very useful; get to see a lot and buy a lot (see 2 July 2011 blog). The venue for this tea expo was at Tropicana Mall. 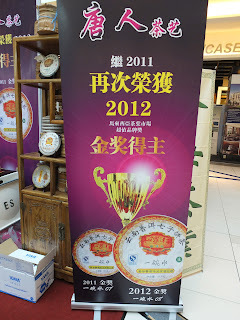 This was interesting as the tea expo was conducted in the foyer, right inside the shopping mall on the ground floor. Getting to the mall for visitors was easy. I got on the Malaysian train line, known there as the LRT and hop off at the Kelana Jaya stop, where I could catch the 'Tropicana Mall' free shuttle bus to the mall itself. It was real easy. This year, I was at the tea expo in the morning of opening day. I was given a booklet where I could purchase some tea and tea products at special prices (pix 1&2). I could buy an item from each group on a daily basis. This meant that if I had attended this expo 7 days in a row, I could buy 7 items from each group. I purchased 2 pieces of 2011 Xiaguan Cang Er Tuo 250g for 35rm. There were many stores that offered their tea and teaware for sale. I could sample the teas that were for sale as well. You can imagine the amount of tea I sampled during the 2 whole days while I was there. There was a bubble tea shop set up at the tea expo selling bubble tea (pix 5). Actually, there were promoting a bubble tea franchise as well. One of my tea drinking friends, Jason who had visited the tea expo had commented - "I just came back to Singapore from the petaling jaya tea fair.. It was fantastic!! The qiu Xiang people were there too, and I bought a load of their 2011 nannuo for 100rm for 3 cakes, and I bought this year spring cang'er raw tuo... Both tasted divine, and I just had to buy them.. Btw.. 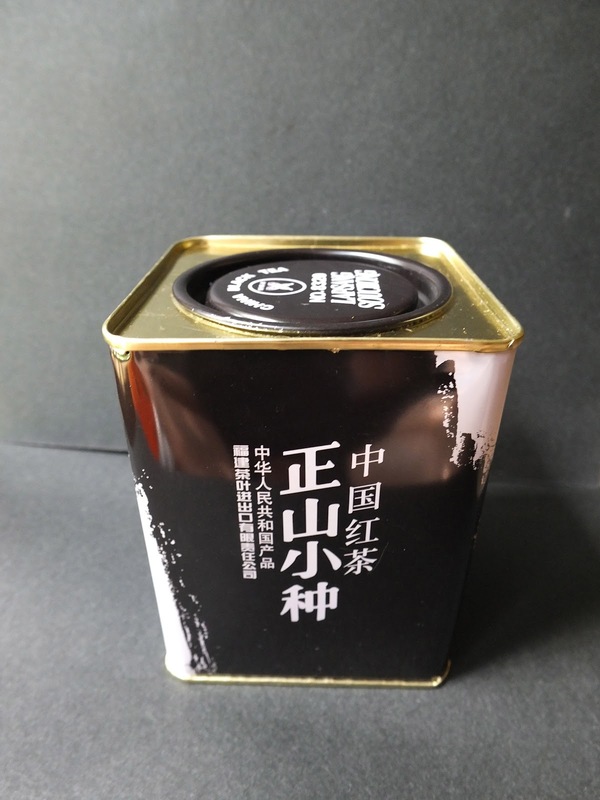 This years cang'er raw tuo won the gold prize for the tea fair.. Only 35rm for 2 tubs. Total bargain!! One of the qiu Xiang ladies even drove me all the way back to my hotel in KLCC because we drank tea till super late.. Awesome people, awesome times."